I’m participating in a blog party with Kristina Stanley celebrating the launch of here first novel, DESCENT. I’ll be online answering question about my second novel THE RIGHT TURN on July 27th. The blog party happens here. Related, Kristina is having facebook launch event for Descent on July 25th here. Unrelated, Maxwell made it into the Victoria Public Library. Right here! This time the free weekend got Maxwell on these two lists. #2 in Dystopian and #4 in sci-fi/genetic engineering. This review went up on Amazon today. 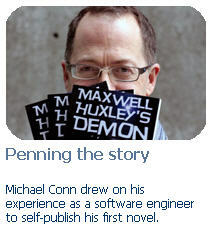 “Michael Conn delivers the action from the first chapter of his debut novel Maxwell Huxley’s Demon. This sci-fi thriller starts moving right away and does not slow down until the final chapter where we are left wondering what’s next. Throughout this we get to know the dark, troubled Max whose technical skills are unmatched. Michael draws on the modern zeitgeist and hits on our fears and anxieties of the modern wired world. This story is a member of a growing league of modern tales that blur the lines between fantasy and what is now our reality. I thoroughly enjoyed this novel and am looking forward to the next installment. 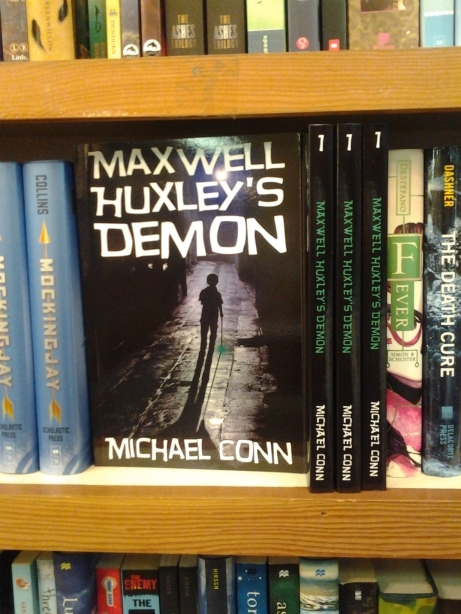 To celebrate Maxwell Huxley’s Demon will go on sale again September 27th to 29th. Here I am just before getting interviewed about Max. Munro’s Books in Victoria has sold out of my book three times now. They’ve now doubled their order. Cycling around Victoria delivering books makes me feel like I’m living in some earlier age. It fun. Nice to see this review from Sydney Australia. The latest promotion is going well and has resulted in Maxwell’s first Italian and Brazilian downloads. Max is back in the top ten action adventure books on Amazon. Ivy’s Book Shop in Victoria sold out of Maxwell again. Now Maxwell is sitting face forward on the shelf. This is very nice to see. Mawell Huxley’s Demon is 14th in the paid for action/adventure category on Amazon.ca. You can track it here.